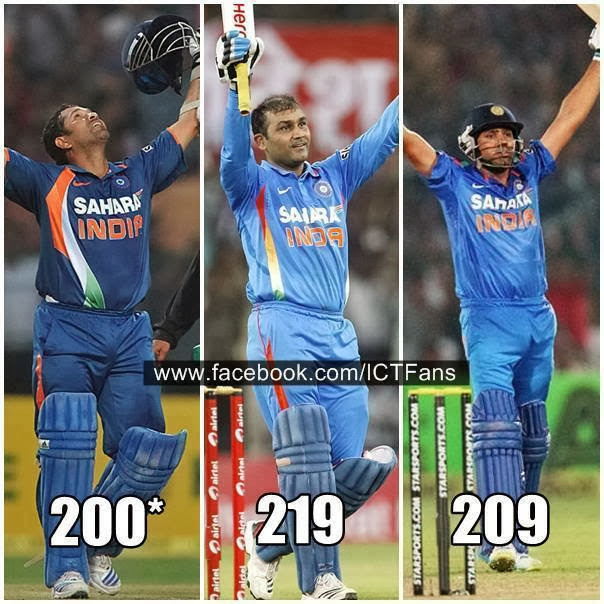 # Rohit became the 3rd batsman after Sachin and Sehwag to score a double hundred in ODIs. # Rohit's 209 is the highest individual ODI innings against Australia. The previous best of 175 was held by Tendulkar and Gibbs. # Rohit (16) broke Watson's record (15) of most sixes in an innings. # India (383/6) scored their highest total in an ODI against Australia and became the first team to score more than 350 3 times in the same series. # Rohit scored 1000 ODI runs in a calender year for the 1st time besides bringing up 3000 runs in his career. # The 36 sixes hit in the match is the most ever in an ODI. The previous highest was 31. # Rohit's 4th ODI hundred was his second of the series. # Rohit became the 4th batsman after Bailey, Misbah & Kohli to reach 1000 runs in 2013. 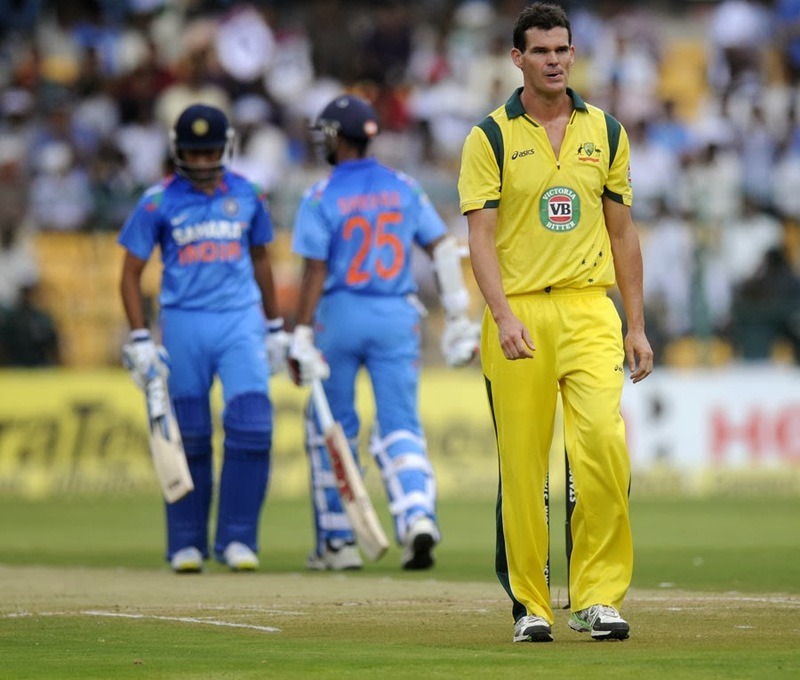 # Before this series, no batsman had scored two centuries in an ODI series between India and Australia. Kohli and Rohit finished with two each. # Rohit & Dhawan added 112 for the 1st wicket, their 3rd of the series & sixth this year, a record by an opening pair. # Rohit and Dhawan put on a 100-plus stand for the third time against Australia. That is the most by any opening pair. # Rohit went past Tendulkar's record of most runs by an Indian in a bilateral series. Rohit finished with 491 from six innings. # India blasted 19 sixes. The highest in an inning before that was 18 (on four occasions) and India had done so twice. # Faulkner got to his maiden 100 off just 57 balls. It was the fastest by an Australian in ODIs. # Maxwell's 18-ball fifty equaled the fastest ever by an Australia. # Vinay became the 1st Indian to concede over 100 runs in ODI.